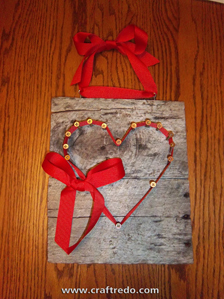 Who knew that weathered wood could create such a stir in the crafting decor world? We have our own little secret stash in the back, hidden from husbands who would love to use it in a burn pile. Want to create your own weathered wood? Contact a local business that may use wooden skids – carpet store, restaurant, building supply, local farmer. Let them know what you’re up to, some may give them to you or offer them to you at a low price. Toss them outside where they will get exposed to the elements, wait a few months and there you go . . . or you can check craigslist. 2. Cut a piece of jute string about the length of your arm span. Wrap jute string 2 times around board about 1/2” from the edge. Tie off, on the backside, with a double not. Trim off bow. This string will have 2 purposes – #1 it will act as a bumper to keep your board from scratching the wall. #2 if your board is not fully dried it will tend to crack and possibly break apart. By tying the string to both sides, when/if it does crack it will stay in one piece. 3. On the top edge of the board, drill pilot holes for the screw eyes to go through. With your fingers twist in screw eyes. To make screw eyes go into the board all the way – place a screw through the eye of the screw eye, use the screw as leverage to turn the screw eye deeper into the wood. 4. On the front of the board – find the center of the board, with chalk and a ruler draw a vertical line down the center of the board. 5. Print off template, it may need to be enlarged or reduced to fit your board. Trim off excess paper and tape template onto your board – aligning center of the template (gray line) with the center chalk line on the board. The black dots on the template are where you will be drilling in the screws for the cross layout. 6. With the hand drill, drill the screws through each black dot on the paper template into your board. Place the ribbon next to the first screw to get the correct depth of your screw. Use the first screw as a ‘master’ to base the depth of the other screws. It works best to start at the top of the design and work your way down. Drill the screws through each black dot, there will be 13 total. When done, pull off paper and tape. 7. Use a rag to wipe off the chalk line. 8. Grab the ribbon. Tie a double knot on the screw marked ‘Start’ (reference template). Take the ribbon to the screw above the ‘Start’ screw, go on the right (inside) of the screw. Run ribbon to the screw to the left, go on the outside of that screw. Go up (outside) to the next screw. Over to the right (inside). Up (outside). Right (outside). Down (inside). Right (outside). Down (outside). Left (inside). Down (outside). Left (outside). Up (outside). Tie off ribbon with a double knot. Trim off excess ribbon. 9. With a separate piece of ribbon, tie a bow around the screw head marked ‘Start’. The knot of the bow will cover up the head of the screw. (We used about 30” of ribbon to make the bow). Trim ends of ribbon at an angle. 10. Cut a length of ribbon, measure from your nose to the end of your fingers, for the hanger. Tie the 2 ends into a bow. Trim ends at an angle. 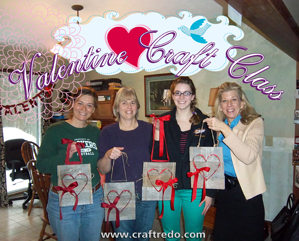 This Sunday, February 10th Katie and Korene will be hosting a Valentine craft session. Deadline to register is 2:00pm THIS Thursday (7th). Finished board will be roughly 9 1/4” wide x 11” high (file attached). If you happen to have a drill (electric or cordless, fully charged), bring it. We will have some available to use – but if you can bring your own drill, feel free to do so. Frames are a great, inexpensive way to showcase just about any item. Any time we are shopping at a resale shop, Goodwill®/Salvation Army® or garage sale our sights are always on the look out for unique picture frames. We prefer frames with bold details and solid construction. So when you’re out and about, keep your eyes peeled for picture frames. Now, grab a can of paint and let’s get going. Take shoestrings out of skates, save shoestrings for later. Remove glass and backing materials from frame. Lightly sand frame. Wipe down frame and skates with a cloth, making sure dirt and dust have been removed. Lay down drop cloth. At this point, lay down wooden blocks (optional). We use wooden blocks to prop up items when spray painting. Doing so, makes it a bit easier to get full coverage of the items you’re painting. Spray paint frame and skates (both sides). Allow to fully dry. Apply another coat. Allow to fully dry. Lace up skates with the smaller ribbon. Use the original shoestrings to measure the length of the ribbon you’ll need. Twist ribbon so the front design of the ribbon shows. If you’re having trouble with the ribbon fitting through the eyelets, wrap the ends of the ribbon with tape. To hang the piece, we attached screw eyes onto the back of the frame. Attach screw eyes on each side of the back of the frame, about 1/4 of the way from the top. String wire through a screw eye, wrap wire around itself to attach to screw eye. Pull wire through other screw eye, holding up piece to see if more or less wire is needed, wrap wire around itself, trim excess wire. 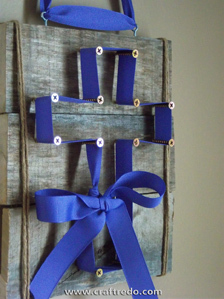 You will be able to hang the piece from this wire with a sturdy wreath hanger. Attach bow with wire (or hot glue or your favorite adhesive). Wrap the wire around the frame, twisting the wire together at the back of the frame for a secure hold. Our friend Tammy showed us how to make the beautiful bow. We used a spool of ribbon that was 9 feet long and it was just enough. Unroll ribbon. Leave a ‘tail’ that’s about 14 inches long, this will be the ribbon end that hangs down. Fold ribbon back and forth onto itself, making a figure eight shape (check out the pictures, you’ll get a better idea of what’s going on here). Do this four times so you’ll have 4 soon-to-be bows on each side. Our bows measured roughly 8 inches across the entire figure eight shape. Hold ribbon together temporarily with a paper clip. With floral wire, wrap wire around the center of the ribbon and twist to secure. Remove paper clip when wire is securely attached. For the center of the bow, do one loop to one of the sides and attach it to the main ribbon with the wire. Our center measured roughly about 2 inches across. Twist wire on the back of the bow so it’s all secure. Spread out the bows. You may need to turn some of the bows right-side-out. Trim ends of the ribbon at an angle. Get bold and unique with your color choices. 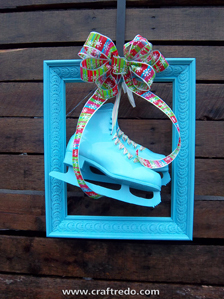 Crafter’s Note: We recommend placing the framed skates in an area that will not have a lot of movement. A door that doesn’t get opened, a wall, etc. Definitely do NOT hang them over a window. The skates are quite heavy. We also recommend to keep the piece in an area that may be protected by the elements. Rain, snow and extreme cold may cause the paint on the skates to peel or crack. The skates are usually made out of leather and the leather may expand/contract due to the temperature change. My skates are hanging inside the house, in our foyer over a closet door (with a very heavy wreath hook). Also, do not hang the piece over an area where children play. Again, the skates are extremely heavy and there always is a possibility of the piece falling. Use thoughtful judgment when hanging your skates. The Photo Transfer Class was a huge success! We had 18 brave participants. Everyone’s projects were beautiful and unique. In the beginning of our class, Korene made everyone pledge to not be disappointed if their projects did not turn out perfect. This is not a 100% photographic technique, rather a semi-rustic technique. 1. Prepare wood – We used a 1×8, 6 foot untreated common pine (construction grade) for our project. We found this species works well and the price fit our budget. Select pine works better, but it’s a bit pricey (over double the cost). Choose a board with minimal knots, without heavy grooves, etc. Cut wood to desired size. 2. Prepare photo on your computer or have it printed out at an office supply store. Make sure the photo you are using is high resolution. If it doesn’t look ‘pretty’ on your computer screen it won’t get any better when you print it out. 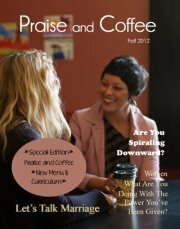 In a photo program, you may want to increase the contrast of the image (the more you work with your computer and printer, the more familiar you will be with the outcome). By adjusting the contrast, details in your photo will be more prominent (this step isn’t required). When printing out your photo – you’ll need to ‘mirror’ the image. This step is necessary. The photo printed out on paper needs to be mirrored so photo turns out the correct way when you transfer it onto your board. It’s similar to a transfer that would be printed onto a T-shirt, where the imagery is in reverse. Size photo to fit your cut wood piece (photo hung slightly off the edge about 1/8 inch on all sides). Print prepared photo on general purpose paper. Trim out photo. 3. Sand sides, face and back of wood piece. Start with a coarse grit paper and then move to the fine grit to get a nice smooth surface. Sand wood with the grain, don’t go cross-grain you’ll get scratches in the wood. Wipe board with soft cloth (we like to use baby socks or whatever discarded cloth we have around the house) to remove any sanding dust and debris. 4. Applying photo to board – Decide which side of the board should be the image transfer side (pick the best looking side). With a paint brush, apply Gel Gloss Medium to the top of board. Use enough Gel Gloss Medium to liberally ‘paint’ the board. Do not leave any dry spots, but making sure not to use too much. Place printed picture face down on your prepared board. Be very careful to line it up correctly. Do not fuss with your photo once it is down on the board. Leave it wear it lands! 5. Gently press the photo onto the board using your hands. Using a roller, gently roll over the photo. There may be a few wrinkles. Do not over roll, excessive rolling may cause the paper to lift off (which is not good). Just go back and forth a few times with the roller to make sure the image is adhered to the board as evenly as possible. Wipe off excess Gel Gloss Medium that may have squirted out the sides. 6. Now it is time to let your project dry for 24 hours. Do not go back and peak at it to see how it’s doing. Leave it alone, walk away. 7. Removing paper from board – After board has dried for 24 hours, get ready to see your results. Wet the wash cloth (not dripping, not totally wringed out). Lay the wet washcloth over the entire board. Lightly press down over the board with your hands to wet the surface. When you lift your washcloth you will see the image is now darker (and getting wet). Check for any spots that didn’t seem to absorb the water (they will look white still) dab these spots with a little bit of water and let it set so the water can get absorbed into the ‘troubled spot’, it will start to turn dark. 8. Once your paper is wet, you are ready to remove the paper. Use your fingers and gently rub/burnish across your board. Paper pulp will start to roll up. Continue this process until you have removed as much paper as possible from the board. Be sure to keep the board wet while you are rubbing/burnishing, this will make the process easier. Do not rub too hard or you may rub all the detail off the board. Go over board one last time with wet washcloth to remove pulp residue. 9. Allow board to dry. We used fans and had dry boards within 15 minutes. You will notice that the colors of your photo will fade as your board dries. Not to worry! When you add a sealer to the board, the colors will look as they did when the board was wet. 10. After your board is fully dried, use sandpaper to sand the edges of board. 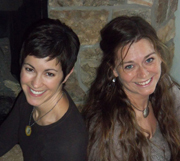 For example, you may want to remove some of the photo from the corners for a more rustic look. Remove any sanding debris with a soft cloth. (At this point, sometimes we paint the sides and back of the board with black acrylic paint.) Apply Mod Podge to the top surface and sides of board. We prefer Gloss Mod Podge, colors appear to pop more with the gloss. 11. 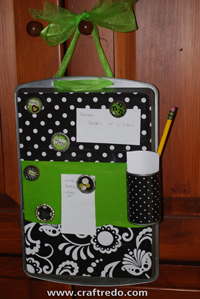 Displaying your board – Your board can be finished at this point, or you can choose to add a hanging method. 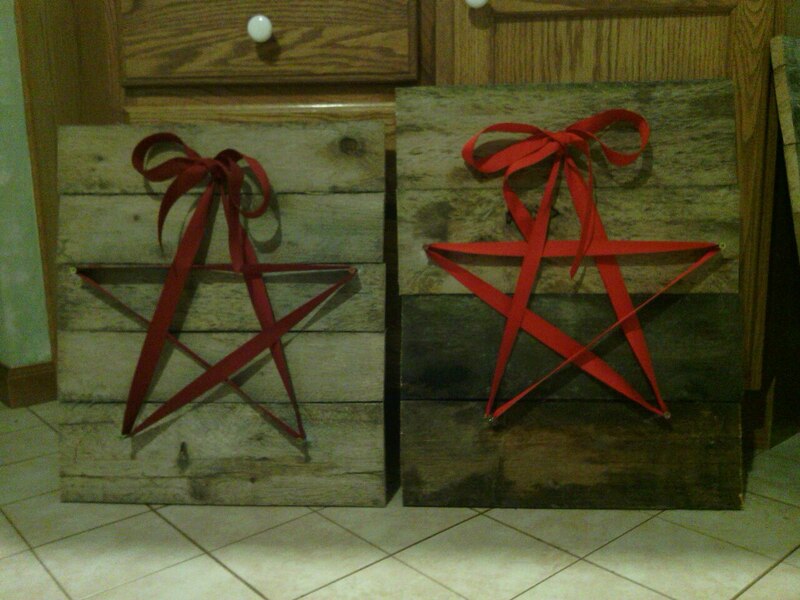 We have used a traditional ‘D’ hook/strap (string ribbon through ‘D’ hook/strap and hang board from ribbon) and saw toothed hangers (both found at your local hardware store). Upholstery nails and ribbon will also work. Poke the upholstery nail through the ribbon, hammer nail onto back of board. 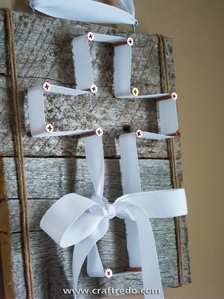 Be crafty, hang or prop it any way you wish! Crafters Note: Inkjet prints VS LaserJet prints. We’ve used both. The LaserJet prints – end product may have a bit more detail, but they’re a bit more costly (plus you have to plan a trip to the office supply store). We like to keep crafts cheap so we mostly use our Inkjet printouts since we have them in our homes. Hey, it’s a rustic technique, if you want something 100% photographic just have a photograph made. Just don’t get discouraged if the project doesn’t turn out the first time. We’ve had to redo projects 3 times. Experiment, you’ll be amazed at what you discover.